The city of Aurora is also known as the City of Lights. I was born and raised in this western suburb of Chicago and love that its nickname so closely resembles Paris' reference as the City of Light. Sure, it may not be nearly as romantic or world-renowned, but it's a great city. With a population of 200,000, it's the second largest in the state of Illinois (after Chicago). Visiting downtown Aurora reminds me of childhood summers spent at the corner diner noshing on French fries, running small errands for my grandmother's bridal shop, exploring the neighboring locals and skipping rocks along the Fox River. I'm so different from that girl. I've lived in other cities, far from home and seen more of the world than that little girl could ever have imagined. I've made pupusas in El Salvador, road tripped to Midwest cities, felt the immensity of the Niagra Falls, danced merengue in Puerto Rico, experienced the unceasing hustle of New York, enjoyed croissants in French vineyards, felt like Hemmingway in Pamplona watching the running of the bulls, ridden in Lisbon trolleys, sunbathed on Mediterranean beaches, tasted chocolate in Switzerland, eaten pasta in front of the Duomo di Firenze and been awed by the sight of historical monuments from the back of a motorcycle in Madrid. ...but I also feel blessed to still feel connected to my hometown. There's nothing quite like the feeling of returning home after a long trip. Nothing like smelling familiar smells, tasting familiar foods and feeling the loving embrace of dearly missed family and friends. I can't say where life's journey will take me, but I'll always know how to find my way home. I'm proud of where I'm from and there's no doubting that it's made me who I am. Here's to all of us, our dreams and our journey. OMG!!! I am completely obsessed with this look you pulled together. How did you manage to take style elements we all know and love and completely make them your own? Girl, your comment just made my day! 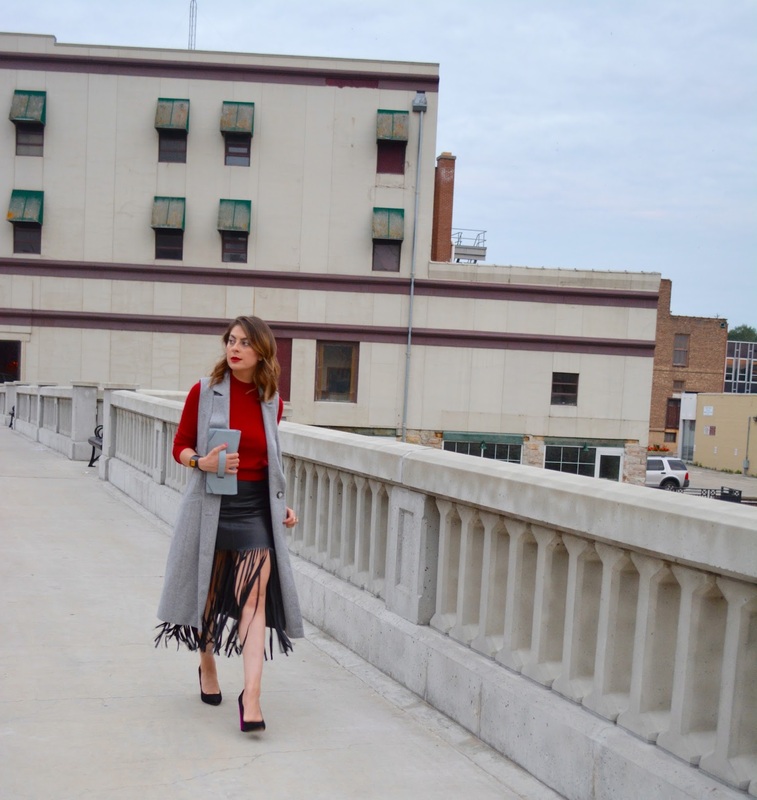 I got this skirt on sale not knowing how I'd wear it until I stumbled upon the vest.